The ALSY, AMSY and ANSY Series is The AMPERIS Corporation’s fully automated, microprocessor controlled test lab in a box. Units allow testing of Gloves, Sleeves, Blankets, Line Hose, Hoods and even Line Jumpers. All standard rubber goods can be tested, even class IV. All machine adjustments are controlled via a menu operated microprocessor control system. With a single selection the test voltage, current limit, depth, water fill level, test time, blower speed and exhaust fan speed are set. In the case of gloves, the operator is required to merely load gloves in the special clothespins, lower the test electrode into the glove and press the start button. Automated water fillers will fill the glove in less than 30 seconds. Tests are timed and an audible alarm sounds failures or test complete, with bright flashing colored lights signaling which position failed, or test complete. Other types of rubber goods are tested just as easily and automatically. The NEW AMPERIS microprocessor control system provides the user with a menu based system to select which type (class, length, new or retest) of rubber good is to be tested. With this single selection, all system settings including test voltage, current limit, glove depth, water fill level, test time, blower speed and exhaust fan speed are set. This eliminates any chance for operator error and provides an extremely fast changeover from one class to another. Current readings for all positions are conveniently displayed on the control panel, and the peak current during the test is saved on screen for easy record keeping. GLOVE TESTING: The machine is capable of testing gloves 10.5 inches through 18 inches long in accordance with the latest ASTM D120 and F496 standards. Clothespin type holders are provided which do not pinch the gloves or sleeves. The center to center spacing is 9 inches to accommodate 40 K.V. gloves. Models are available to test one to twenty eight lineman's gloves or sleeves. SLEEVE TESTING: The machine is capable of testing all standard sleeves in accordance with the latest ASTM D1051 and F496 standards. Sleeves can be tested by the AMPERIS hammock method using the clothespins provided and the two 2" diameter spacers used to eliminate sharp bends in the sleeves. With –D models this method allows testing of only half as many sleeves as gloves. With –W models this method allows a full load of sleeves. As many sleeves as gloves can also be tested by the straight method using one of the freon replacement fluids in the bottom of the tank. BLANKET TESTING: The machine is capable of testing one or two blankets (depending on model). The bottom support is covered with a non-tracking film to eliminate drawer damage due to flashovers around the edge of a blanket. All standard size and voltage blankets including Class IV 42” x 42” can be tested. One set of electrodes is provided with the tester for each position. Additional electrodes are available for all sizes of blankets. LINE HOSE AND HOOD TESTING: The machine is capable of testing two six foot long line hose or two standard hoods. The brand, size and model of hose and hoods to be tested need to be specified when ordering to ensure propoer electrodes are provided. LINE JUMPER TESTING: One or two line jumpers may be tested in the test tank in place of gloves or sleeves. VOLTAGE: The input voltage is 120/240 volt 60 hertz A.C. single phase. The L series has 0-50,000 volts A.C. test voltage provided by a 12kva continuous duty transformer. The M series has 0-100,000 volt D.C. supply. The N series contains both supplies and a transfer switch for changing between the high voltage supplies. The test voltage is measured by means of a resistive divider connected directly across the high voltage circuit. An LCD diplays the output voltage both digitally and with a bar graph. The test voltage is raised and lowered with a special solid state device at a rate of approximately 1 kilovolt A.C. or 3 kilovolt D.C. a second. CURRENT: The current of each glove/sleeve being tested is continuously monitored by the microprocessor control system. The active current leakage as well as the peak current is displayed on an LCD display both digitally and with a bar graph. HIGH VOLTAGE TEST TANK: The tank is constructed of 12 gauge stainless steel. The outer lip and all edges are smooth and rounded to a .75 inch radius to eliminate corona from the tank at voltages to 50,000 volts A.C. and 100,000 volts D.C. A one inch drain valve is provided in the bottom of the tank to drain water. When gloves are lowered into the testing position, the excess water is held in an overflow basin on the rear of the tank by physically raising its discharge hose. This provides a maintenance free shut-off which eliminates high voltage arcs caused by water dripping from the tank to ground during the test. At the end of the test, the discharge hose is lowered and the excess water allowed to drain into a catch basin. VENTILATION: Approximately 9 cfm of air flow is directed into each glove/sleeve to remove the ozone generated inside it while testing. The exhaust manifold at the rear of the machine pulls air across the surface of the water through an inlet which is the length and even with the top of the high voltage tank. This removes ozone generated on the outside of each glove/sleeve. ENCLOSURE: Eyebolts are provided in the top for lifting by a crane. 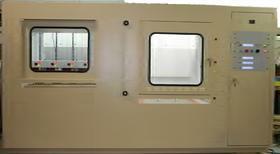 An interlocked access door is provided to the testing area at the end opposite the power supply and control area so the operator can go inside the machine for cleaning and maintenance. Fluorescent lamps are provided inside the unit and are wired so they can be operated when the unit is turned off. 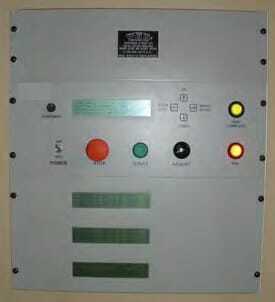 An interlocked front access door is provided in the power supply and control area. WATER FILL: Each glove is filled through a .375" tube to permit simultaneously filling each glove within 30 seconds. CONTROLS: A menu based system provides all controls from the front control panel. All standard tests come predefined for the user. These predefined tests set all the machines settings and automatically run the test on the specified class of glove or sleeve. There are also 10 user defined test modes available, as well as a mode for manual control of the entire system. INDICATORS: All LED light indicators operate in a fail safe mode by being lighted at all times. The lights flash when indicating. A red "HIGH VOLTAGE FAILURE" light and an amber "OVERCURRENT" light are provided on the carrier just above each glove. A red " FAIL" light and a green "TEST COMPLETE" light are provided on the control panel. The LCD current display shows the current leakage current, as well as saving the peak current. After a failure the LCD display also indicates which gloves failed. OPERATION: The operating cycle begins after the operator selects the new type of gloves to be tested from the menu, which automatically adjusts the depth, water fill level, test time, voltage, current limit, blower speed and exhast fan speed with a single setting. If the type is not changed from the last test, then no menu selection is required. Next the items to be tested are mounted in the machine. Then the operator simply pushes the "START" button. The machine can be fully loaded with material or just one item can be tested. Gloves will be simultaneously and automatically filled with water to the proper level. The water filling can be bypassed at any position that does not have a glove or on all positions when testing sleeves. The gloves/sleeves will be lowered into the high voltage tank. The high voltage cycle consists of raising the test voltage to the set value, automatic timing of the test duration, automatic flashing lights for overcurrent or failed gloves/sleeves, audible indication of failed rubber goods, and the lowering of the test voltage. At the end of the cycle, the gloves/sleeves are returned to the load position. At the end of all tests without a high voltage failure, a green "TEST COMPLETE" light flashes and a pulsating audible signal sounds. Do you want to buy high quality Insulation resistance meters? Inquire for our Insulation resistance meters prices.